Ready to impress? 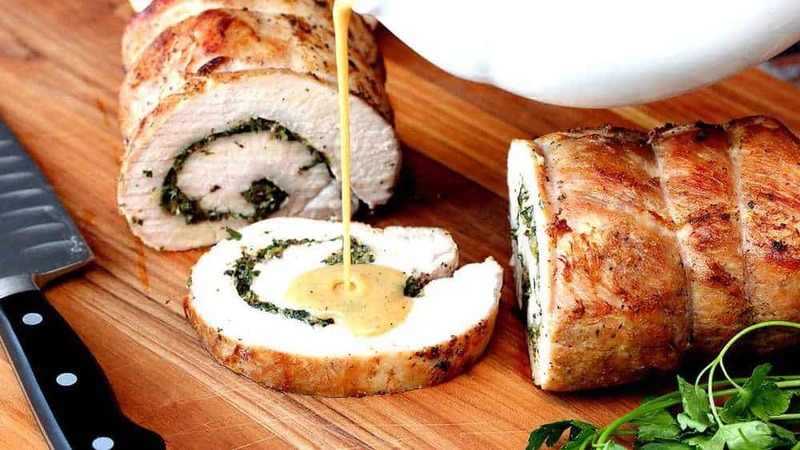 Make this Herb-Stuffed Pork Loin recipe. This roast is incredibly moist and explodes with flavor. 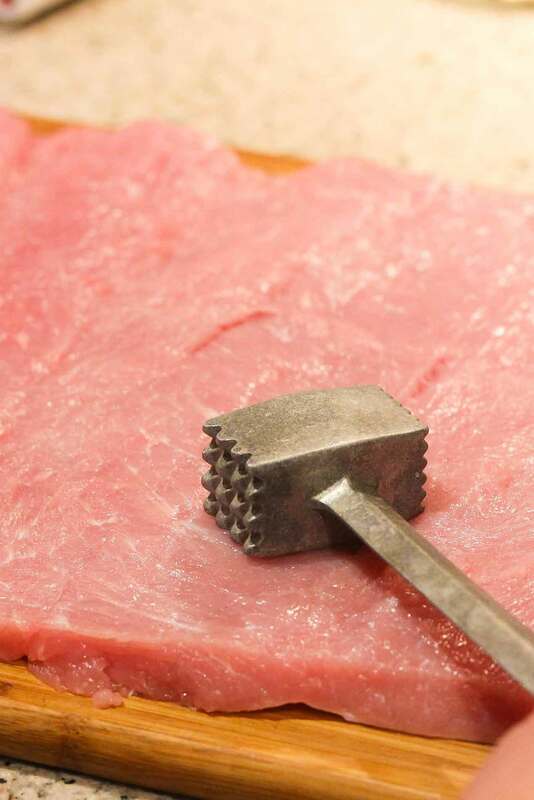 Use a sharp knife to butterfly the roast open and then use a side of a meat mallet to thin the loin. Add the amazing filling to the meat just before you roll it up. We just love the pan gravy that we serve with it. You can easily prepare this ahead of time, up until you put the roast in the oven. 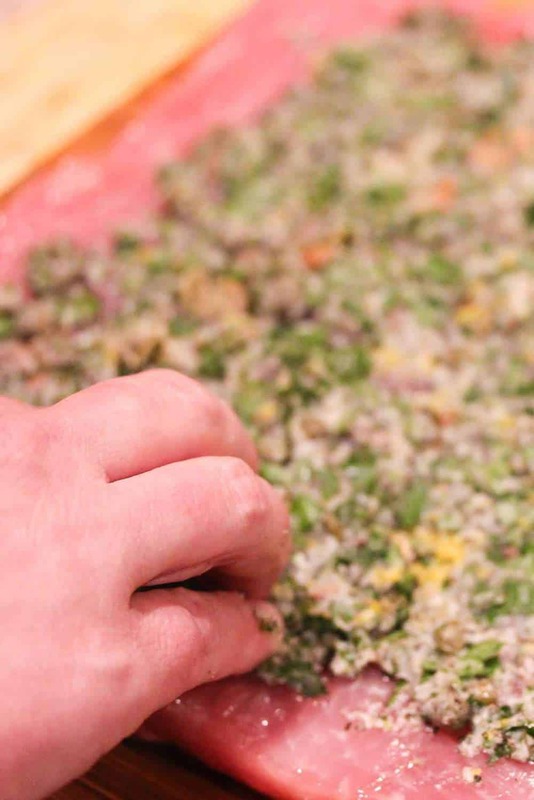 Then roast, quickly make the sauce, and you and your guests will be so impressed. A really special dish. 100% Loon Approved! 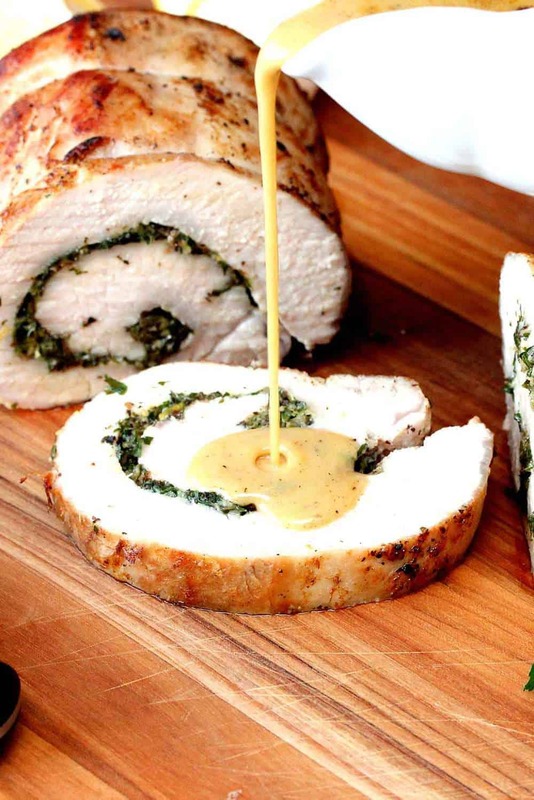 Now, make this amazing Herb-Stuffed Pork Loin! 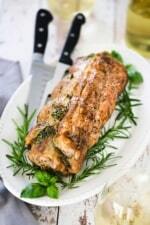 This Herb-Stuffed Pork Loin is a crowd-pleaser for sure. The pork is so moist and flavorful, and the filling is brimming with flavor, and just so good. And the sauce puts this dish over the top. Perfect for a nice dinner party. Your guests will be so impressed!! Butterfly the pork loin,by starting with the fat side up on a cutting board. Insert your knife 2/3 of the way up from the bottom, and carefully begin cutting horizontally. Stop about a 1/2 inch from the end, and open up the flap. Now, continue cutting down by pivoting your knife so you are cutting back in the opposite direction, about a 1/3 way down from the bottom of the roast. You are opening up the roast to make a flat piece of meat. Fully open the flap (see pictures for reference). Cover with plastic wrap, and pound with the side of a meat tenderizer until the roast is between 1/4" to 1/2" thick. Combine the brown sugar and 1 tablespoon salt in a bowl and then sprinkle all over the roast. Transfer to gallon-size zipper-lock bag, seal, and refrigerate for at least 1 hour, or up to 24 hours. Heat 1/4 cup oil and sliced garlic cloves in oven-safe 12-inch skillet over medium-high heat until garlic begins to brown, about 3 minutes. Transfer garlic and oil to a separate medium-sized bowl and let cool for 5 minutes. Stir Parmesan, parsley, basil, capers, anchovies, lemon zest, and 1/2 teaspoon black pepper into garlic oil. Place roast cut side up on cutting board. Spread Parmesan mixture evenly over surface of roast, leaving 1/2-inch border on all sides. Starting on the short side, roll the roast tightly, and then tie with kitchen twine at 1-inch intervals. Season the roast with black pepper. Heat remaining 2 tablespoons oil in now empty skillet over medium heat. Sear roast on all sides until browned, about 12 minutes. Flip roast, seam side down, in skillet and add shallots, rosemary sprigs, and whole garlic cloves Transfer to middle rack in the pre-heated oven. Cook until thickest part of roast registers 135 F. (about 1 hour and 10 minutes). Transfer roast to carving board and tent with aluminum foil...let rest for 30 minutes (Don't clean skillet, yet). Meanwhile, use a fork to smash garlic in skillet. Place skillet over medium-high heat and cook until shallot and garlic are sizzling. Add wine and cook until nearly evaporated, about 2 more minutes. Add stock and cream and bring to a boil. Reduce heat to medium-low and simmer until sauce is reduced to about 1 cup and thickened, 10 to 12 minutes. Strain through fine-mesh strainer set over small sauce pan; discard solids. Stir in lemon juice and season with salt and pepper, to taste. Cover and keep warm. Discard twine from roast and slice into 1/2 inch servings. Serve, and pass sauce separately. Haven’t made anything like this in awhile! Thanks for the inspiration! 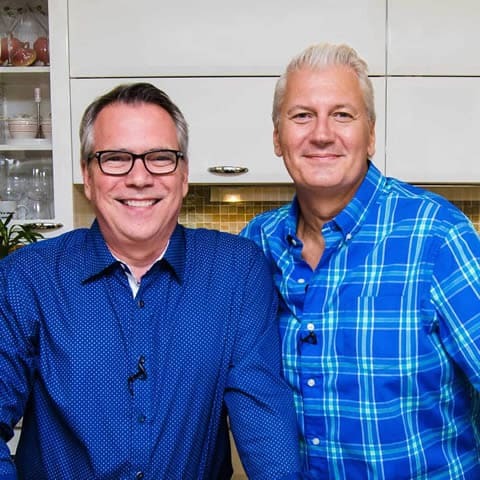 It sounds and looks delicious and love the sauce/gravy….. so many yummy recipes here! Can’t wait to try some!